Finally we are seeing full bloomage (is that a word?) 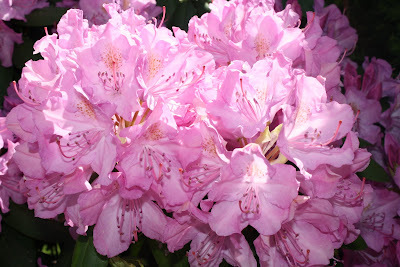 of our spring perennials. I know so many of you have already been enjoying this for a few months now, but it's finally our turn to enjoy here in New York. Believe me, I'm no green thumb. As a matter of fact, I'm more the type that gives the orders (plant that here, trim that, move that, etc.) and my poor, but wonderful, husband just follows along like he's the paid gardener. (How does he put up with me?) I will plant flowers as long as they're going in a flowerpot. The minute I have to dig in the ground, I am so far outta there! I'm afraid of anything creepy crawly. It is so hard to capture the color of them, no matter how hard I try. To me, they almost seem fluorescent, the color is that vivid and bright. I adore my orange azaleas as well. Although, they were fading away here. The color is gorgeous! 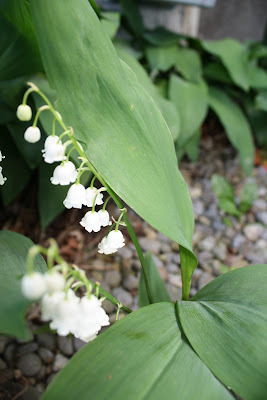 Not the best photo, but my lillies of the valley. Oh the scent of these...I especially love how I can smell them inside the house when there's a breeze and the windows are open. 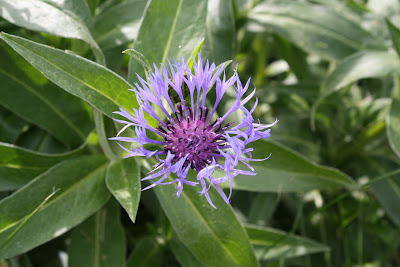 I love these purple flowers. I have no idea what they are called, they were planted by the previous owner. 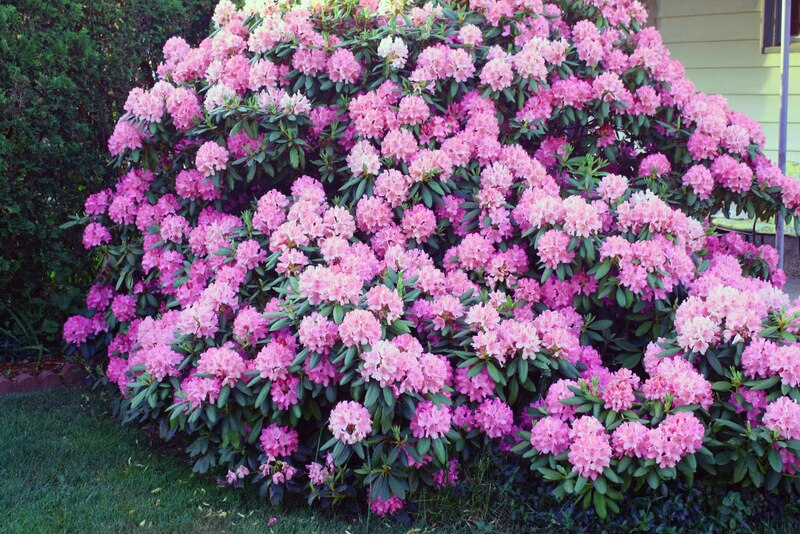 And last but not least, my giant rhododendron. This was also planted by the previous home owner and might I say that in the last ten years since we've lived here, this thing has grown by leaps and bounds. It's easily 6-7 feet tall. 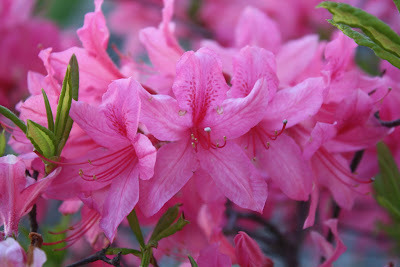 I know I need to have the gardener, er hubby, trim this, but I'm afraid. I think if we do it wrong, it'll never bloom like this again. That's all I have for now. The weather here has been beautiful. We've been in the pool several times already which is kind of unusual for us in New York, but we're not complaining, believe me. I'm off to relax with a nice, cold glass of lemonade. You should grab a glass too. I'll be back to post the winner of my cottage giveaway on Saturday...good luck! 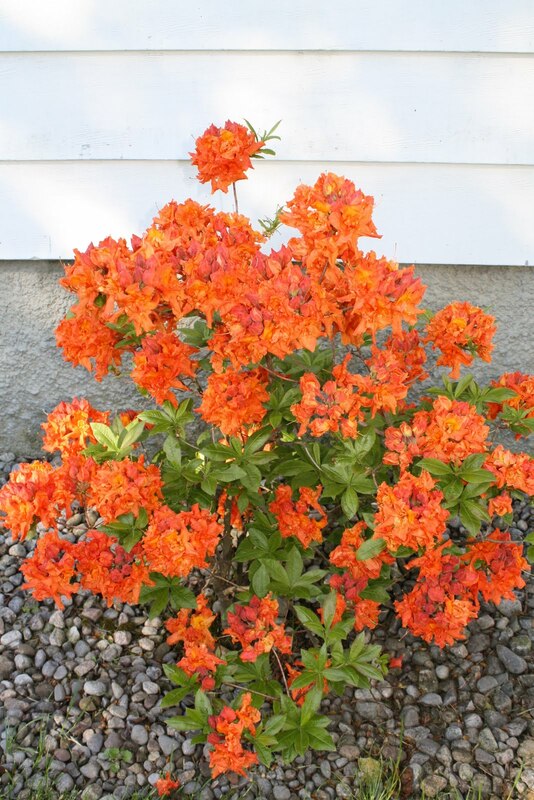 I love those orange azaleas, gorgeous. No green thumb here either. 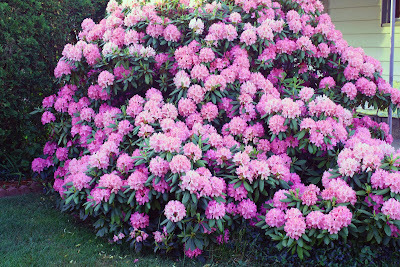 Your garden looks so pretty. I adore the Lily of the Valley. Oh Gina, all your blooms are beautiful...I too am no green thumb, but I do try...honest :-) My mom says it's a matter of trial and error...You'll get it. Oh but what to do about the creepy crawlies? Not fond of those either :-P Have a wonderful weekend my friend.